The most powerful form of advertising is also the oldest: word-of-mouth. That’s because even though the topic may be you and your small business, the source is an individual…a customer, colleague, business acquaintance, even a total stranger…who passes along that information to his/her network, lending it an important dimension of credibility and trust. While word of mouth itself is a highly organic, low-cost form of advertising, it begins with you, the small business owner, and what you do to generate it. Though it is possible for this kind of “buzz” to take flight spontaneously, word-of-mouth is typically the result of planning and effort. In other words, you have to give people something to talk about, and take steps to make sure they know about it. One of the easiest ways to generate word-of-mouth is a no-brainer…do a good job for your customers. When you provide exceptional service, particularly if it helps solve a problem, they’re going to feel good about you and what you do. But you do you need to encourage them to spread the word and refer others to your business. Many people will be more than happy to do that on their own, but providing an incentive such as a discount for every new customer they refer may also help. 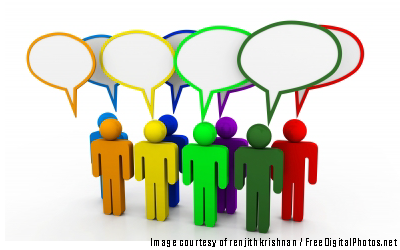 Networking among business and professional groups is another easy way to stimulate word-of-mouth. But avoid the hard-sell. Before you start shaking hands and handing out business cards, think about some of the questions people may ask about you and your business and prepare some brief, to-the-point responses. The so-called 30-second “elevator speech” is a good start, but apply the concept to other areas…your background and experience, the types of customers you’ve worked with, and so forth. And also be ready to ask the same kinds of questions to the people you meet, and take a genuine interest in them and what they do. Donating your products or services to local charities can generate goodwill and get your name around the community, while a careful plan of introductory discounts or free samples can also get people talking. Blogs, Facebook pages and other social media sites are also good venues for building visibility. The key is to focus on topics of interest to your prospective customers, e.g., how they’ll be affected by emerging trends, tips for handling certain issues, or how you helped a customer address a unique issue. As long as focus is on sharing useful information, customers will see you as an expert, and encourage others to find out what you have to offer. To learn more about marketing your small business, contact Raleigh SCORE. We provide free, confidential business mentoring and training workshops to small business owners. To schedule a free appointment with our experienced counselors, go to http://raleigh.score.org, or call us at 919-856-4739.